SAP or timed HE semi-fixed shell. Star shells were also available. VT shells were available later in the war. This gun was used on a number of carriers and battleships and the "Battle"-class destroyers. It was similar to the American 5"/38, but not as capable, with a much longer firing cycle, slower training and traverse, and an inferior director. However, it was capable of firing VT shells, with radar proximity fuses. 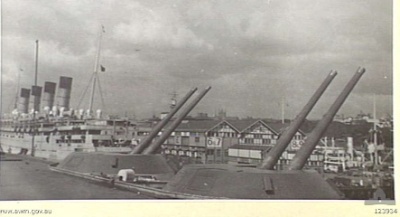 The gun was typically mounted in a twin BD (between decks) mount and the first trial installations were made in 1936. The gun was also adopted by the British Army as an antiaircraft gun.